NetMeds.com is an online pharmacy which claims to be the India’s oldest and largest pharmaceutical company that has more than 100 years of experience in selling all sorts and types of medications – high quality prescription drugs, over the counter drugs, generic medications or the original forms as well as many other different health care products and medical equipment as well. The company is claiming to be located in India and they are an initiative of Dadha & Company. The information on the site suggests they are offering medications for more than 100 years as they claim to firstly operate in 1914, however it is obvious that the online pharmacy website has been opened up much recently. According to the information on the site, the pharmacy is offering the most high quality medications, FDA approved drugs to every Indian customer. 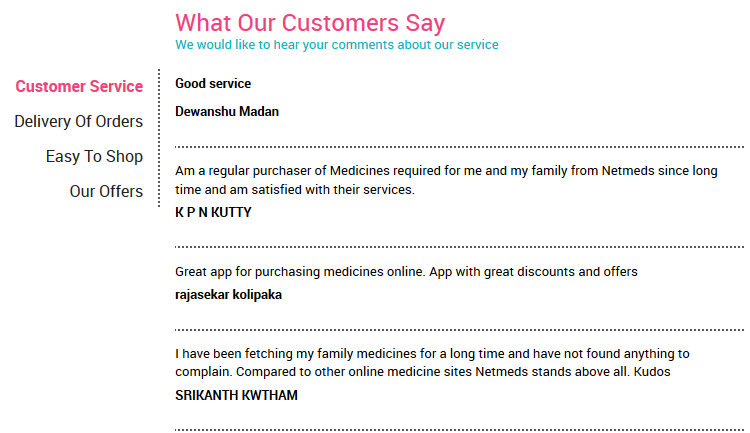 NetMeds.com is the first choice of Online Pharmacy in India and they are already having more than 3 million of satisfied customers which is an extremely big number. there’s information suggesting that customers can conveniently purchase medicines online, anytime, anywhere. The pharmacy is claiming to have some awards and recognition being selected as *Asia’s Most Promising Brand 2018* including others. They claim to be a team of highly experienced pharmacists that can help every customer’s needs. They are claiming to offer a large inventory of medicines and also, customers are able to find out the expiry dates of medications while ordering. Ultimately, the pharmacy is claiming to be the most trusted and reliable pharmacy which ensures their customers that all drugs are being supplied only from reliable manufacturers. In addition to all of this, the company is claiming to be proud of its first class customer support service which is providing reliable drug information to the customers. The company is promising an easy payment method, purchasing procedure a complete privacy and security when doing business with them. To be ensured of legitimacy of this pharmacy, they have also shared their license number on the site. 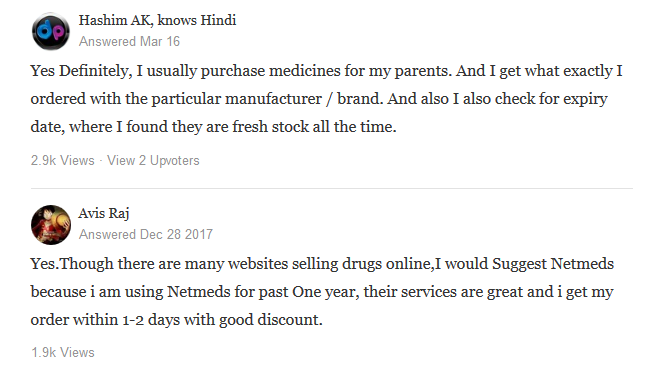 NetMeds.com is an online pharmacy which claimed to offer a lot of different medications and from as much as I noticed, the pharmacy is indeed offering a lot of drugs. There are a couple of main categories of medications including prescriptions, ayush, fitness, personal care, family care, lifestyle, treatments, devices and health library. Plus to that, they are offering different categories of drugs such as featured categories which includes Body care, Eye Care, Facial Kit, Hair Care, Hand & Foot Care, Lip care, Men’s Need, Nail Care, Oral Care, Skin Care, Women’s Need, Blood Glucose Monitors & Strips, Food & Beverages, Fitness, Specialty, Supplements and others as well. Obviously, I got interested in checking the prescription drugs where I found categories as: Acid Reducers/Acid Reflux Medications, Allergies, Anti-Depressants, Antibiotics, Asthma Medications, Cold & Flu Medications, Diabetes Medications, Ed/Impotence, Hypertension/High Blood Pressure, Osteoporosis, Skin Diseases and there were a lot other medications. There’s also a number near each category suggesting how many drugs you’re supposed to find in the said category of drugs. Checking all those numbers, the pharmacy indeed should have an extremely wide selection of drugs. I mostly got interested in checking ED types of medications where I noticed they are offering more than 240 drugs only for this condition. There seem to be a lot of different drugs, Viagra brand, Cialis brand but no Levitra brand. I have then searched for generics and I noticed that Viagra and Cialis are available while generic form of Levitra (vardenafil) is not available either. They have listed 2 products of vardenafil but none of them were available. All in all, this online pharmacy seem to offer a lot of different medications for a lot of health conditions including prescription, herbal and OTC medications as well as generic and branded drugs. The number of categories is extremely large plus in each category there are a lot of different medications. Although they do not have vardenafil in stock, they claim to make it available soon as it can be shipped to them in a few days. Taking everything in consideration, I would say that this online pharmacy is offering a very large selection of drugs for which they deserve a rate of 5 stars. Although this online pharmacy has claimed that all of the medications featured in their drugstore are all safe to use, high quality and FDA approved, they are still offering generics of the same high quality. This allows customers to save some money. I have checked the prices for medications where I found the following: Silagress 50 mg (which is a name for sildenafil citrate manufacturer) would cost you 72 Rs per unit. Converting that would be 1.01 USD per pill of generic Viagra. I have then checked the price for brands where I saw that Viagra 50 mg is priced with 822 Rs and converting that’s around 11.52 USD per pill which is not such a good price to be honest. I honestly think that you can save quite some good money if you’re going to purchase generic Viagra but comparing the price per pill of brand Viagra on this pharmacy with other pharmacies, I doubt that you would save anything. Checked the price for Cialis generic 20 mg as well. 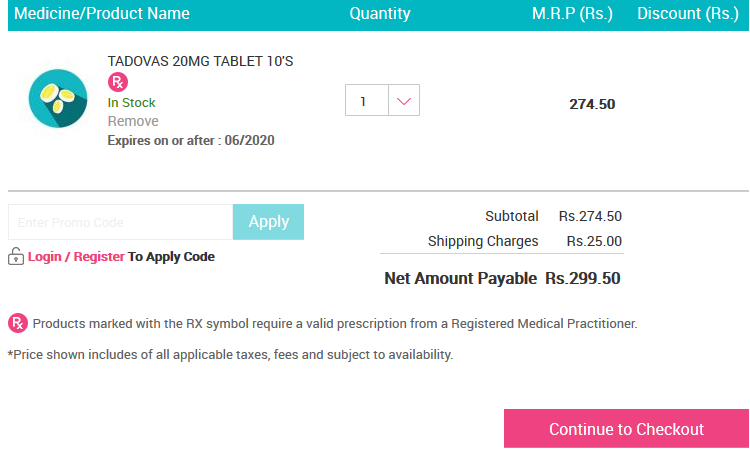 the price is 274.50 Rs per pill and that means that the price for generic Cialis 20 mg per pill is 3.85 USD which is also not a really good price comparing the prices for this medication to other online pharmacies. In the end, I would say that the prices for medications here are moderate, depending on what exactly you’re purchasing. If you’re looking for generic Viagra then you can indeed save some money here, however, you won’t be saving any money if you’re going to purchase brand Viagra or generic Cialis, for example. I can assume that all other drugs are in the same price range – moderate. For this reason, my rate is 3 stars. I have taken a random Indian pincode In Assam - City Jorhat and the delivery was around 10 to 13 days. That’s a normal shipping period time. As they claim, all the orders are shipped via EMS or courier with the shipping fee of 0.75 USD (already converted) for all orders. Also, every customer who orders from them is going to get a tracking number with the help of which they would be able to track their parcel online. The pharmacy is also using a free delivery option to all of the orders that are starting at 15 USD (or more) if they would use a promo code. Other things to mention here is the fact that this pharmacy is offering a full refund in case the customers have got damaged or expired products, or if a part of their order is missing. All in all, the shipping options are getting a rate of 4 stars from me due to average shipping time and no option to get overnight shipping option. The first thing that I noticed is one big advantage this pharmacy has: the COD payment method. That’s the customers most preferred payment method since that’s Cash on Delivery meaning customers have no risk of losing money. The customers are going to pay with cash when the courier is delivering to the address. Nowadays, this is an extremely rare payment method as very few pharmacies are willing to use this option. The customers choosing this payment method won’t have headaches and are risk free of losing money. But except for COD, there are many other payment methods such as Credit/ debit cards, net banking, netmeds e-wallet and many others. No doubts, the pharmacy is receiving a rate of 5 stars for the variety of payment methods accepted and their convenience. Technical characteristics of any website, nowadays, is extremely important, and that’s especially when it comes to page loading speed. Except for the fact that it is important to get high quality drugs and good prices for them, I find it another important factor to have a pleasant and fast shopping experience online. Using Google Page Speed I have found managed to find the data about this website which shocked me: the pharmacy’s website technical data are by far not satisfactory. To my opinion, those are some really low indicators and a big disadvantage of the pharmacy that they should take in consideration. The page loading speed is too low and customers may not want to be waiting for the page to load. Since this can be pretty inconvenient for some people my rate for this unit is 1 out of 5 stars. Without even using the Google Mobile Friendly Test I found out that this pharmacy does use a mobile version, and it is not the fact that they use a mobile version of their website – they are using a mobile application which is able to be downloaded for all devices using the iOS or Android systems. The pharmacy is claiming that all customers are able to download the netmeds app for free and this would allow them to have a fast and pleasant experience ordering drugs online from their smartphones. The mobile application seems to be very easy using it. In the end, the mobile application does seem to be an extremely attractive option for a lot of customers out there. I do think that this is going to make the shopping experience as pleasant as possible for mobile users. My rate here is 5 stars. According to the information on the website, all the customers are getting maximum privacy and security levels as the pharmacy claims to understand how important this is. They are promising that all the data is encrypted and checking for this I did found out this is true as the company does offer a 256 bit key SSL encryption on every page. Every customer can check this themselves by checking for that *green lock*. I checked for more details and I found out they are using 256 bit key but I also found the owner information misses. My rate is 4 stars for all of this. A big disadvantage that I noticed on this online pharmacy is the fact that the company is not paying too much attention to the internet threats which is a really big threats, especially lately. That’s because I checked for an antivirus software on their website and unfortunately, I couldn’t find one. Customers can get viruses to their devices and since the company doesn’t take care of customers’ safety while browsing through their site, my rate is 1 point. How to Order from NetMeds.com? Before saying how to order here, I would like to say that the website and its design overall is pleasant to browse and navigate through. I would say that this really attracts customers, as a good design of the site is very important to my opinion either. Or alternatively, as you can see in the photo, you can upload a prescription and they would send the medication accordingly. After you choose your needed medications click on it and you would see details about the drug. You can also see the available substitutes for that drug if you’re interested. you can see a lot of information about the drug on that page. Anyway, estimate your shipping time and click on *add to cart*. Repeat this until you have added all the needed drugs to your cart. Then click on the *virtual cart* on the upper right side of the page. Review the information and click *checkout*. Then there’s the problem, you should be registered to continue. 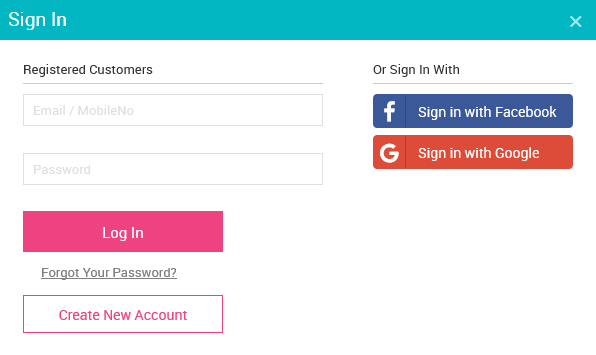 You can sign in with Facebook or google, but you can’t go on checkout without a personal account. I honestly think that not all customers may want to share their personal details before ordering. Requiring for a registration to my opinion is too time and energy consuming. Plus to that, all the prices are in Rs. and I would like an alternative to change the currency. For these reasons, the convenience of ordering gets a rate of 2 stars. 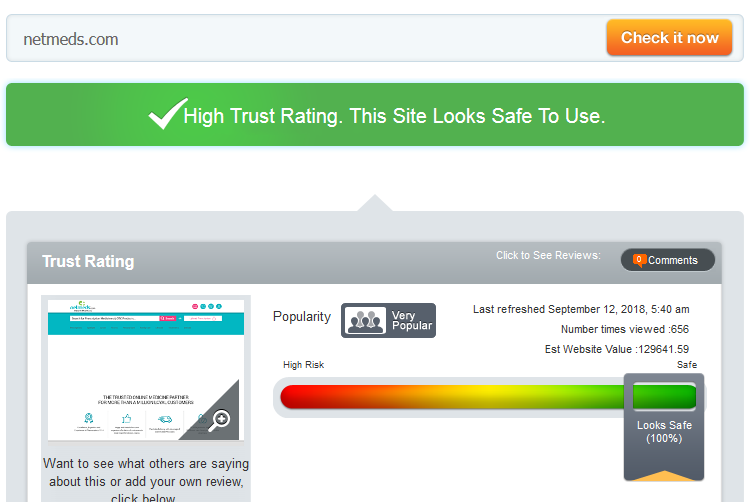 According to the information I found on scamadviser.com, this is a very high trust rating website and it is looking safe to be used as it has a maximum trust rate index of 100%. The website seem to be very popular and plus to that, the domain age is really old (enough to have trust), and the owner country, phone number and organization all seem to be from India. It is obvious that NetMeds.com is receiving a rate of 5 stars for this scamadviser.com reputation. The customers are able to see if their searched medication is asking for a prescription or not. The customers can easily upload the prescriptions for ordering drugs. Since the pharmacy has a serious approach of selling drugs online my rate is 5 stars here. That’s extremely strange to me the fact that an online pharmacy that has been operating for more than 14 years online and has so many customers being popular according to scamadviser.com, has nothing on legit script. Seemingly, LegitScript.com didn’t included this pharmacy in their database and that’s really strange. I can assume that’s because NetMeds.com only ships to India, but I’m not sure. There are reviews on their website. You can see a couple of them on their main page but customers are asked to *check all the reviews * if they wish to. It seems that their customer reviews are based on different things: customer service or delivery of orders or easy to shop or about their offers. By reading a couple of reviews I found out that all the reviews are positive with no negative review. Plus to that, most of the reviews are writing reviews only in English which is strange to me as all customers are Indian. Lastly, there are no dates attached. Those reviews may be outdated – we don’t know. Plus it is hard to have trust in those reviews since there are only positive reviews, no dates and you should send the review to be examined by administrators first. This means that negative reviews might be deleted. My rate is 2 stars as it is hard for me to have trust in those reviews. I rate it with 2 stars only because the reviews are unique. I’ve been checking for customer reviews about this online pharmacy on other independent websites where there are chances for negative reviews to appear since the administrators of this site have no chances to reach them and delete elsewhere other than their own site. On different medical forums and reviewing websites, I have found a big number of customer reviews, and there the reviews are both negative and positive as well. Many customers are claiming that they have saved a lot of money here, they got great experience overall and they never had a problem with their high quality drugs. However there are other people who said that they never got a delivery or refund, they got wrong or expired products, products that simply does not work calling them counterfeit, or the fact that pharmacy is promising discounts but do not give them. Also inexistent customer service too. All in all, there are enough customer reviews to have trust in this pharmacy calling it reliable. However, there are still customers who complained about this pharmacy’s activity saying they lost money. Most of the customers who left reviews are still positive and for this reason my rate here is 3 stars as losing money with *reliable company* isn’t a good sign and there are way too much negative reviews as well. 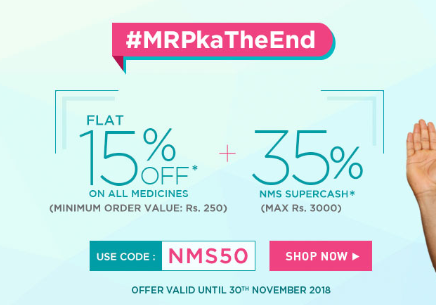 It does seem that this online pharmacy is offering coupon codes. And it is not that they only give one coupon code, they are offering many different codes, plus, they are offering many other different ways to save money. Except for the coupon codes, the pharmacy is also offering cashback up to 50 % in certain circumstances and customers can also save money by referring friend and earning discounts. There seem to be a lot of different ways to save money that people can read by clicking the banner on the pharmacy’s main page. But in the end, the customers are having a lot of ways to save money and that’s why I think the pharmacy well deserves a rate of 5 stars. Before getting on the pharmacy’s contact page, I have found out the pharmacy is offering their customers an ability to write to the pharmacy if they wish or to call by the phone number listed on the bottom and upper website. I then clicked on *contact us* and I have seen the same methods – calling or writing by contact form. I only noticed that you can also contact them using 3 phone numbers via WhatsApp. The contact information greatly misses – the pharmacy’s address, emails and many others. For this reason, they receive a rate of 3 stars. Since there are no ways to get in touch with the pharmacy other than WhatsApp, calling by phone number or writing them by contact form – I decided to use the last method I mentioned here and I wrote them. 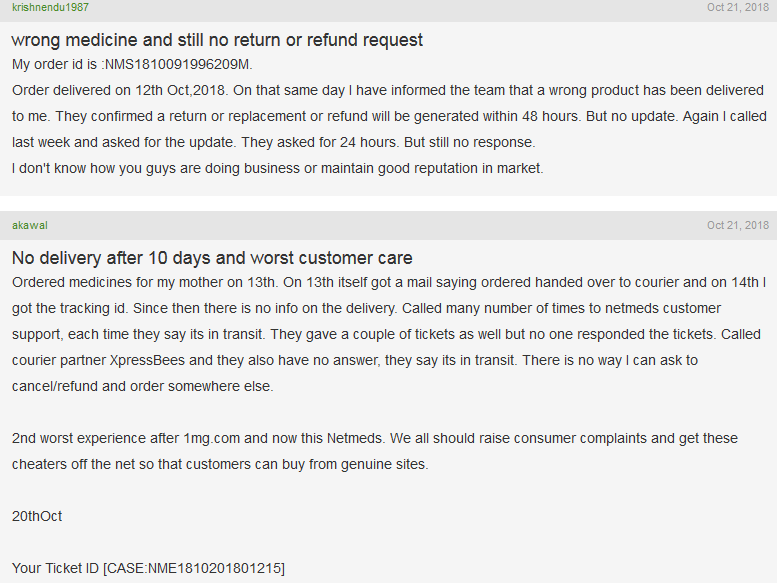 I have asked them more about the shipping delivery times and if they do ship outside the India. The answer arrived back really soon in my email. I got a fast and professional response and that’s making me rate them with 5 stars for the customer support service. NetMeds.com is an online pharmacy which is offering a lot of different medications for a lot of different health needs. The assortment diversity is extremely wide here as they are offering thousands of different drugs – generic and branded. The pharmacy has moderate prices depending on what exactly you’re searching but they are offering a lot of ways to save money with lots of coupon codes. The company has not been reviewed by legitscript.com but it is highly legitimate on scamadviser.com. This pharmacy overall does seem to be a reliable and licensed company. However I’m not very sure if it’s worth it so I let everyone to decide to themselves. Important factors to pay attention to is – the company is very popular but it has a lot of negative reviews out of those many positive ones. Plus, they offer a high security, but no antivirus. Ordering requires a registration and technical characteristics of the site are poor. The pharmacy does have a lot of payment options including COD, however they ship only in India.